MoGo is Detroit’s first public bike share system designed to build equity in transportation for all demographics. Designed for quick trips around town, MoGo serves as a fun and convenient way for Detroit citizens to get where they need to be in a sustainable fashion. As fellows for the organization, we were given autonomy in creating independent projects in order to improve the overall accessibility of MoGo. Although we began the program primarily expanding on the Adaptive MoGo Program, we quickly found new ways to contribute to other areas of the organization through our various projects. Adaptive MoGo is a program that allows those who can not ride a traditional two wheel bicycle to enjoy the thrill of biking via adaptive bicycles. The program primarily caters to the disabled and elderly. We worked to improve the outreach of Adaptive MoGo by reaching out to various organizations that would be interested (i.e nursing homes, senior centers, disability organizations, rehab centers). Our work consisted of telemarketing as well as presentations to event coordinators/administrators of these organizations. Although MoGo currently has a following on Instagram, Facebook, and Twitter, we decided that a Snapchat marketing campaign would appeal to millenials and further the organization’s outreach. We began our marketing by creating geofilters and placing them in strategic areas to be seen by Snapchat users in the area. On the day of the fireworks to celebrate American and Canadian Independence, we placed a geofilter at Hart Plaza, the most popular location to view the fireworks. In this short time span, our geofilter was able to garner 4.1k views, 2.8k swipes, and 104 total uses. Detroit Experience Factory is an organization that provides guided tours to allow newcomers and locals alike to become more connected with the people, places, and projects in Detroit. Although DXF’s work is slowly improving people’s perception of Detroit, we believed that biking tours would provide a new perspective to the city. After coordinating with team members at DXF, we were able to implement MoGo in a comprehensive bike tour of the Riverfront, Eastern Market, and the Dequindre Cut, which took place on July 19th, 2018. Last year’s DukeEngage Fellows for MoGo were tasked with working on an Evaluation Plan for MoGo via different surveys. We continued on their work by developing a casual intercept survey for passerby Detroiters at various stations and members returning/checking out MoGo bikes. With the help of MoGo’s Brand Ambassadors, we were able to implement these surveys at nine different stations to gather relevant information such as consumer willingness-to-pay price points, demand for single trip passes, and current barriers to using bike-share. In addition, we developed a member feedback survey that would be emailed to current and former members. The purpose of this survey was to determine customer use and satisfaction. In addition to our main four independent projects, we had the opportunity to assist the MoGo team in their own initiatives and lay the framework for post-summer projects. Build Institute is a small business incubator established in 2012. Located in Detroit, Build seeks to empower people, especially those in small neglected neighborhoods with the tools, knowledge, and resources necessary to start a business from scratch. With the “Start, Build, Grow” education model, Build provides numerous courses like Build Basics and Co.Starters that tailor class material to participants at different stages of entrepreneurship. Furthermore, Build offers micro-lending opportunities through Kiva and give graduates access to their partners for additional funding. To date, Build Institute has 1475 graduates who have gone through one or more of its programs. Build Institute relies on information from its alumni for grants and funding. Valuable information such as amount of business created by the incubator or specific minorities supported through programs are crucial for Build Institute's funding. This task involved creating and managing a survey that successfully and accurately obtains information from alumni while maintaining a low margin of error. Developed logic based survey that effectively and concisely obtained valuable information from alumni including demographics, business information, and satisfaction rates. Artfully crafted questions to eliminate bias and retain user attention. Researched effective incentives for the survey to maximize response rate. Implemented and maintained an Amazon incentives program for the survey. Response rate more than doubled from last year due to incentive. Researched effective survey techniques to maximize user satisfaction. Looked into which specific words, question formats, and question orders to increase response rates. Developed unique identification procedure for the anonymous survey. Developed a method in which a unique but identical code is generated each time per specific user, which allows for data to be tracked across time per alumnus while keeping the alumnus' identity and sensitive information anonymous. Went through all 1475 Build Institute alumni and researched alumnus to determine his current business status. Utilize Facebook, LinkedIn, business websites, Instagram, and the NeonCRM to determine whether a business was active or not. Measures Build’s impacts on Detroit economy and society since 2012, with a special focus on 2017-2018. Complied basic information on Build, their history, mission, vision, staff and program offerings. Evaluated these tools by reading reviews, browsing through prospective websites, and assessing experiences with their free trials. Presented to GLF Detroit’s program executive director and program associate on the top 4 tools researched and individual assessments of tools. Worked with branch leaders to choose SmarterQueue as the social management tool of choice for GreenLight Fund Detroit with its capacities and needs. Created a science fair board for a entrepreneurship summit held in Missouri. Presented key statistics regarding Build, their program structure, and photos that best represent what Build does. Build intends to push forth a paid alumni membership in which subscribers can request special services and create alumni and business directories. Build is moving to a new office next year that enables them to have more free space and rooms. As a foundation for Build’s rebranding program efforts, we did research on over 20 chambers of commerce and co-working spaces in Detroit and elsewhere. We compiled a list of models for membership structure, co-working space models, and pricing structure for advertisement on alumni directories. After looking at various relevant models, we came up with model recommendations that best fit Build. The NeonCRM was a relatively new system the Build team recently adapted; one project was to develop this system to utilize its functionality. Cleaned the system by removing 750+ duplicate individual and organization accounts in the system and merging appropriate accounts with one another. Implemented alumni membership. This is a membership which alumni can subscribe to in order to consolidate Build Institute's alumni and uniformly provide benefits and relevant information to them. Also instituted the membership to easily access information regarding Build Institute's alumni, including demographic data and business info. Rolled out the membership to alumni by pushing out easy-to-follow instructions to all alumni. Coded the frontend of the alumni portal, providing a more user-friendly experience for the alumni while they navigate their new NeonCRM accounts. Coded visually appealing layout for alumni, allowing them to easily see announcements, builders in the news, events, and requests/message board. ProsperUS Detroit is a nonprofit that belongs under the umbrella of Southwest Solutions. ProsperUS is composed of three different pillars. These include entrepreneur training, micro-lending, and business services assistance. ProsperUS has played a pivotal role in helping primarily minority entrepreneurs in the greater Detroit area grow their businesses. Our first major project at ProsperUS Detroit was to update the mapping for ProsperUS’ lending team. This map includes every business that has closed a loan through ProsperUS. On this map we included location of the business, business type, and loan amount. This was an effort for the lending team to have a greater understanding of where exactly they were executing their loans. This map is of course confidential with sensitive information as it relates to the financials of these individuals. In addition to updating the lending map, we also updated the in-business map for ProsperUS. This is a much more general map that includes all businesses that have any affiliation with the nonprofit. These businesses are run by graduates of the training class, recipients of business services, and loan recipients without including their financial information. We expanded this map by researching each business that belonged to these three categories and seeing which ones were transactional. This included calling recent graduates of the training class to see where they were at with their business. We also looked at the original map and removed any that were no longer in business. We created an excel sheet to accompany this map. The second major project we conducted was storytelling interviews. Blake did two interviews, and Ava also did two interviews. These interviews were with affiliates of ProsperUS who were recommended by ProsperUS staff for their incredible story of resilience and worthiness of a long write-up. We collectively agreed that this was the best project because it was really neat to hear their stories. After doing these interviews, we did long write-ups that will later be published on the website. We had these stories reviewed twice before submitting final drafts on WordPress. We also gathered multiple photos to accompany each of these write-ups. REMINDER – Stories have not yet been posted on the website. Check back on http://www.prosperusdetroit.org/impact/ to see the stories once they are posted. This was by far the lengthiest project we conducted during our time at ProsperUS Detroit. To begin this project, we reached out to the trainers of the entrepreneur training class to see their feedback on how the curriculum currently addresses the topics of the financial templates and business templates and maybe places we could improve on those subjects. Blake was responsible for doing the financial templates portion of this project. The popular feedback we received from the trainers as it related to financial templates was the need to have electronic recording sheets that included formulas to automate most all computations. In addition to this, there was also expression of the need for more clarity over what exactly these values mean for the entrepreneur. Blake attempted to tackle both of these concepts when making these Google Sheets. He made a template for daily, weekly, and monthly bookkeeping, accounts receivable/payable, credit card journal, and the three financial statements. In addition to the template for each of these, Blake also took screenshots of the different formulas and included a formula guide for each template. There was also the creation of a direction list and glossary to accompany each sheet. Ava was responsible for doing the business plan template portion of this project. We received similar feedback for the business plans from the trainers so Ava wanted her templates to be exhaustive enough to include criteria for businesses across many industries, but not too exhaustive that entrepreneurs feel intimidated by the prospect of a business plan. Ava included a glossary to go with her template to ensure that there was no confusion for any of the categories. *These templates will soon be branded and utilized by ProsperUS, but you can see previews of them in the final presentation below. Blake updated historical data for both lending and business services for evaluation purposes. This helped these groups get a better sense of the racial and gender breakdown of their clients amongst many other categories. We created an off boarding infographic for graduates of the entrepreneurship training class. This sheet has contact information of each member of the ProsperUS staff and potential reasons for why someone would reach out to them. Updating lending portfolios for closed loans. This was done for potential future audits. Helped an entrepreneur fill out a Hatch Detroit application which is a grant meant for individuals opening up a brick and mortar space. Also helped this individual create financial projections for the same application. TechTown Detroit is a business incubator that supports entrepreneurs all over Detroit. Within TechTown, the Blocks programs specifically help serious retail entrepreneurs with excellent ideas and experience. This help reaches to all types of retail stores, ranging from bakeries, coffee shops, clothing boutiques, grocery stores, fitness studios, hair salons and other service-based or lifestyle business, as well as small manufacturers. SWOT City is a program within the Blocks section of TechTown which provides unique support for all Brick-and-mortar businesses in Detroit neighborhoods. Skilled professionals help owners with one-on-one assistance, creating a plan to help launch, stabilize, and grow their business which strengthen local neighborhoods and districts. Retail Services also help entrepreneurs get ready to launch their own retail business. Retail Bootcamp is at the core of this, which is an intensive 8-week program that prepares entrepreneurs to open their Brick-and-Mortar business. Along with this training, Retail Bootcamp also provides funding, office space and a network of resources that owners can take advantage of to start up their business. Cass Collective and The Shop are programs under other Retail Services that are pop-up opportunities that entrepreneurs can use to help grow their business. The available data was in two places: Old Microsoft Excel Sheets and TechTown’s custom database MINOS. To prevent any repeats in data that might have been in these places, we used a code called a macro in Microsoft Excel. This code highlighted and deleted any duplicate entries to make our results more accurate. Used the same methods for data acquisition used for the SWOT City report to do the Retail Bootcamp report. Retail Bootcamp also included a survey section for past clients to fill out. This was an additional form of qualitative data that we organized in order to figure out what the outlook on the program was. Created suggestions for this survey in order to increase the percentage of clients that fill this out, and how to make it more convenient without changing the program itself. Included suggestions for how data acquisition for these two programs can be better in the future. This was our final presentation which was a summary of what we accomplished over the summer as well as some of the graphs we used for out data. 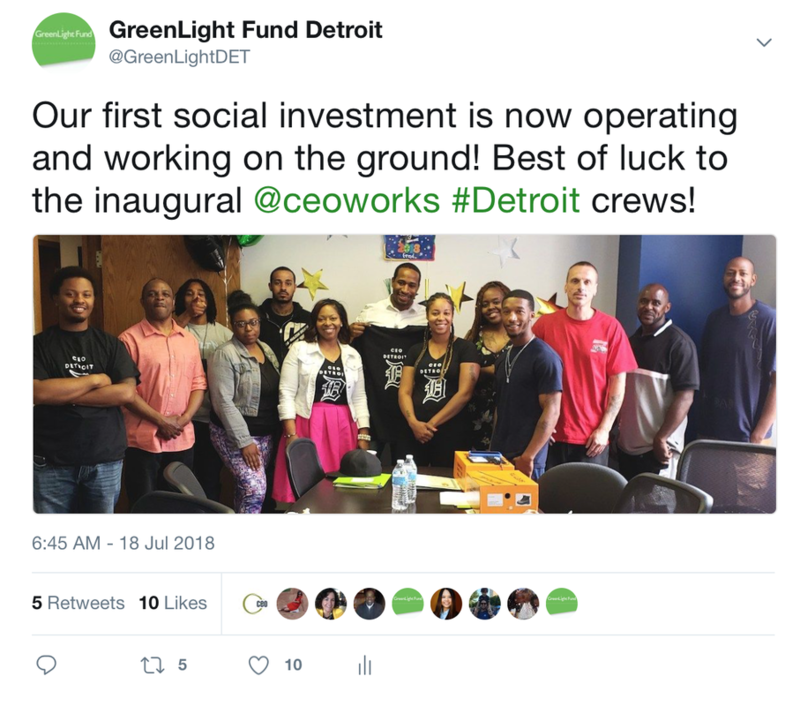 GreenLight Fund is a nonprofit organization currently located in seven cities, one of which is Detroit. Every branch goes through an annual, five-step process that culminates into a single social impact investment. First, they work to discover and identify the most pressing social issues affecting low-income families and children within that specific city. Second, they scout the country to find organizations and nonprofits that work to combat the chosen issues. Third, they choose a single organization that best fits the community and that has an effective and innovative model for tackling the issue. Fourth, they invest in this organization so that it can open up a branch in the city and begin making a social impact on the community. Fifth, they measure the effectiveness of the organization within the city and whether its programs are making a difference in what they were set out to do. To ensure the local landscape of the city is perfectly understood, there is also a Selection Advisory Council made up of around 30 local leaders that meet with the city’s branch leaders a couple times a year to give advice on which issues GreenLight Fund should focus on and which organizations are best suited for Detroit. Used Salesforce to write up individual organization assessments for all organizations being added to our pipeline. These assessments include information on program model, results, national board members, number of sites, and 990 financial information. ​Also entered the research into a Google spreadsheet for Detroit branch members specifically to look at and work with. This spreadsheet included information on the program, outcomes, other site locations, contact information, as well as a link to the Salesforce organization assessment. 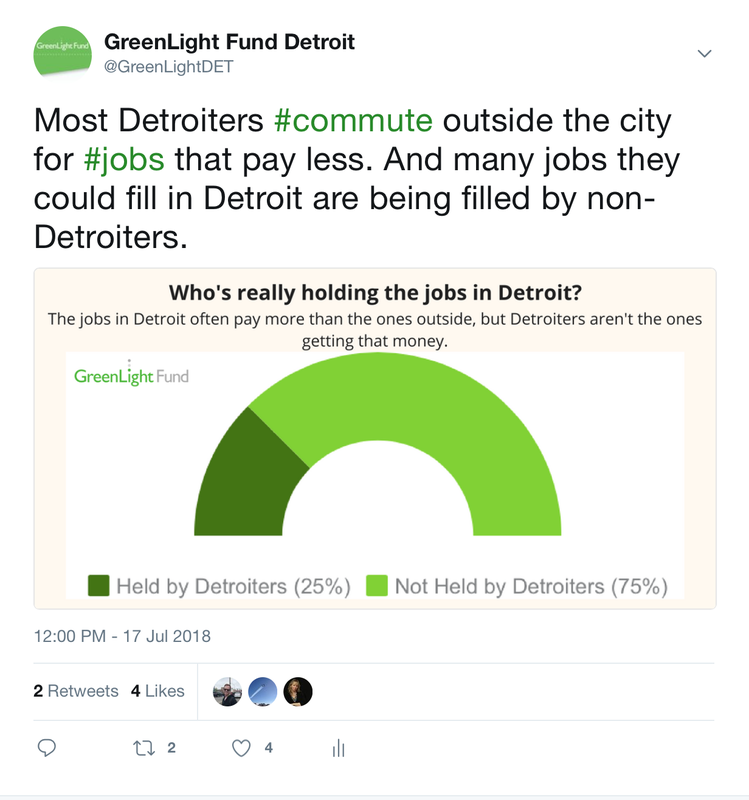 Created a database in a Google spreadsheet with the social media habits of GreenLight Fund Detroit’s partners: these include organizations similar to GreenLight Fund Detroit that are also in the Detroit area, members of the Selection Advisory Council, investors, and accounts related to GreenLight Fund in other cities. The database had information on their websites, Facebook, Twitters, as well as how they best showcase social impact. Researched and compiled notes on the best communications practices for nonprofits similar to GreenLight Fund Detroit. Also looked to see whether any accounts in the database had made use of these practices and how it had worked for them. Presented a communication strategy for GreenLight Fund Detroit moving forward based on the analysis conducted about other accounts and research on communications practices. Compiled a list of 150 Twitter handles for the GreenLight Fund Detroit twitter account to follow and engage with. Evaluated 12 social management tools based on whether it had a calendar display, how many people could be on it at once, pricing, and other logistical criteria. Organized findings and research into a Google document and a Google spreadsheet. Developed a tweeting schedule for GreenLight Fund Detroit. 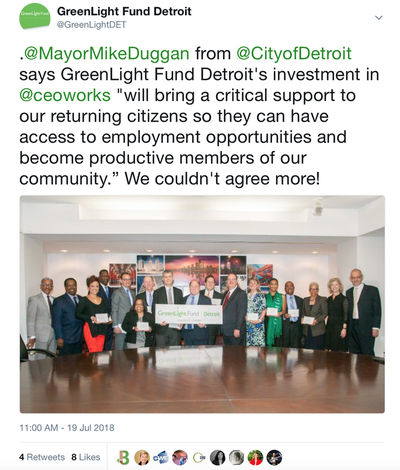 Composed 150 new tweets to be put out over the next 6 months that both apply the social media analysis research and develop GreenLight Fund Detroit as a thought leader on social impact. Interacted with a variety of social impact leaders in Detroit. Wrote blog pieces on pressing issues in the Detroit community to be published on the GreenLight Fund website and later linked to in a tweet. Worked with Canva and Piktochart to create infographics to supplement the tweets. Implemented SmarterQueue and worked with branch leaders to determine the best-suited way to use the tool and organize tweets for the week. Wrote a set of detailed instructions on how to continue the social media and communications practices I have set up after we leave. Researched 80-90 scholarly and mass media articles on the Social I’s and E’s (Impact, Innovation, and Entrepreneurship). A few of the sources were the UMich Ross Center for Social Impact, the Skoll Foundation, and the Stanford Social Innovation Review. A few of the mass media outlets were the New York Times, Forbes, the Huffington Post. Included local and national organizations who put these terms (social impact, social innovation, and social entrepreneurship) into practice like Rebel Nell, Goodwill Detroit, and the Empowerment Plan. Compiled research of definitions and practical examples organizations into 4 robust, categorized documents. Final Deliverable: A working Social I’s and E’s Framework document, which includes the 3-4 positive and 3-4 negative definitions of each term and 3-4 positive and 3-4 negative real-world examples or organizations who espoused these terms within their mission statement or vision (Organized in a Google Document). The overall purpose of this project is to establish common language and alliance of intent for Detroit and national players in the social impact and entrepreneurship ecosystem. GLF Detroit aims to be a thought leader in the social impact/entrepreneurship space. With a common language comes a foundational understanding of the terms from a proven, evidence-based standpoint. Researched social entrepreneurs/entrepreneurships, social impact/social impact support organizations and organizing my findings into a robust database of 40-50 entries. Organized findings in a database with categories like org. type, sector, resources offered, url, description, contact info, etc. Final Deliverable: Database of 40-50 social entrepreneurs, thought leaders, social impact support organizations, and nonprofits, and for profit entities who have been tied in one way or another with the Detroit’s social entrepreneurial ecosystem (organized in a Google Document). Searched for potential funders, partners, sponsors for the Fall Launch Event for CEO, GreenLight Fund Detroit’s first investment. The launch event will be GLF welcoming the organization to the city and fostering more funding and partnership support for CEO. Prospecting (contextualizing the fundraising ecosystem) is essentially the first phase of event fundraising. Top 10 workforce development companies/organizations in Detroit, along with the executive leadership from these organizations. From this prospecting, determined who would potentially support CEO. The top philanthropies and foundations in Detroit and CEOs/Directors from these organizations. Potential funders from companies/organizations who have just entered Detroit. Final Deliverable: Robust pipeline of 40-50 potential supporters and funders for the Fall Launch event (Organized in a Google Spreadsheet). In context of sales and funding, a customer relationship management (CRM) is a technology for managing a company’s relationships and interactions with customers and potential customers. Due to its organizational framework, GLF interacts with and connects with a broad array of people and organizations. The infrastructural CRM created this summer allows GLF as a nonprofit to more easily manage personal relationships and connections, allowing the organization to better inform its own network and vice versa. 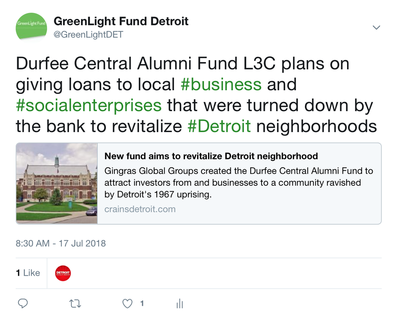 Provided an infrastructural CRM for GLF Detroit to use in the future for organized and intentional storage of individuals in its network who could be potential partners, funders, etc. The CRM tool created is coupled with data analytics of the database including numeric and visual distributions of individuals or partners with specific attributes such as type of organization affiliation, contact type, and source of interaction. Final Deliverable: Framework for the CRM tool with 20+ categories with contacts from work-associated Twitter, LinkedIn, Facebook, and previous individuals in GLF’s immediate network. The CRM tool includes filtering tools, extensive settings, and data validation/drop-down lists (Organized in a multi-tab Google Spreadsheet). The CRM tool also comes with user instructions (Organized in a Google Document). GLF will be having its national retreat that will be taking place in Detroit this year. The executive leadership/national team of the organization will participate in tours and be exposed to the multi-faceted narrative of Detroit. Researched and determined tour locations, transportation options, catering options, and general tour logistics for the national team. Mapped out the tour routes in Detroit and optimized the travel times for the 6-hour tour. Detroit Food Academy is a 501(c)(3) non-profit that works with local educators, chefs, and business owners to inspire young Detroiters (ages 13-24) through self-directed entrepreneurial experiences rooted in food. Small Batch Detroit is a culinary training and employment program within Detroit Food Academy. Small Batch acts as a first paid job for DFA students who are seniors in high-school, serves as a training ground for alumni interested in the culinary arts, and generates revenue that supports Detroit Food Academy through the sale of Mitten Bites, Slow Jams, and Detroit Pop Shop. When we first met with Jake and Julie to discuss our projects for the summer, we were asked to focus on 5 general areas: the DFA Fellowship program, marketing, production, alumni development, and nutrition and fitness research. While we used these broad categories to guide us, we feel fortunate that Jake and Julie gave us autonomy in creating and developing some of our own projects. We ended up completing projects within various spheres of DFA and felt especially connected to the Fellowship projects. We took many high-quality photos of Small Batch products, employees, and fellows in their work environments to enhance DFA’s social media presence and available content. We created social media calendars for the months of July and August on behalf of Small Batch. We were responsible for the content and timing of posts, and experimented with various marketing strategies, especially social media contests. We created a funder-facing presentation that Small Batch will utilize to display their programming alignment with NRAEF standards. If successful, the NRAEF will provide funding and support for Small Batch participants. Below is a compilation of some of the digital media we created, in addition to the NRAEF-Small Batch presentation link. We developed curriculum for a financial literacy program that will be implemented for future DFA and Small Batch participants. The curriculum encompasses numeracy, budgeting and saving, basic investment principles, tax and insurance, and homeownership with a focus on apartment-living. Similarly, we developed curriculum for a nutrition and fitness program that DFA will utilize internally to educate its own students and also to educate kids involved in other programs who work alongside DFA. We focused on concepts including healthy vs unhealthy carbs, fats, sources of protein and exercise. Identifying a gap in DFA’s data, we decided that it would be in the best interest of the organization to possess a masterlist of every individual who has gone through the program in any capacity. We thus created a masterlist through excel that is searchable by the following criteria: name, school, and years in the program. Small Batch lacked an efficient tracking system to organize the hours worked by each employee. We created an organized document and simultaneously developed a method to track these hours by categorizing employee hours under three main categories: culinary work, leadership, and health. The first category consists of sub-categories that correspond to an NRAEF standard. This physical representation of how Small Batch’s work structure resembles the NRAEF trajectory will assist Small Batch’s acquisition of funding. The latter categories will be used for Small Batch’s own internal organization. Below is a sample of the Training Hours Breakdown document for a Small Batch employee. We were originally tasked with engaging with Small Batch alumni and helping them plan for the future. After speaking with several of them, we realized that there was a slight aversion to any sort of goal-setting activity. Essentially, the alumni didn’t believe a low-commitment activity like that would help them enact change in their lives. We knew we had to put a lot of effort into connecting with them and urging them to go after available resources and opportunities, so we met with each individual several times and created a customized “Post-Small Batch Plan” for everyone. This document functioned differently for each individual but was generally focused on providing extensive information about resources that would help them achieve what they wanted to. Below is one of the Post-Small Batch Plans we created. Jake and Julie often joked that the Fellowship program was our baby for the summer. We were tasked with assisting five DFA fellows (17-18 year olds) in their creation of a digital project that would display their unique skills and talents. Furthermore, we were asked to guide their professional development as they transitioned out of high-school and into college or the workforce. We met with each fellow several times over the course of 6 weeks to plan and create a digital project. The projects included two personal websites, two videos, and a presentation. The fellows will be presenting their work to an audience at the Green Garage in August. To guide the fellows’ professional development, we created resumes using a professional template and facilitated a workshop about networking and interview prep. While we were not originally tasked with this project, it became one of our largest projects of the summer. We felt that a video series highlighting the people within DFA could simultaneously help our fellows display their talents and serve as a powerful marketing tool for DFA. Below are a link to a fellow's digital project, the itinerary/notes for the professional development workshop, and the Fellowship Video Series. If you would like to learn more about what we did this summer, below is a link to our final presentation! Detroit Food Academy is a non-profit that works with local educators, chefs, and business owners to inspire young Detroiters (ages 13-24) through self-directed entrepreneurial experiences rooted in food experiences which open doors, create connections and spark confidence. The first half of our summer was basically content creation. We took over 300 pictures and produced 5 videos. We also created a presentation for a sales pitch to make it easier for DFA to reach out to potential clients. We did market research as well as looked at past data to have a quantitive measure of what DFA was doing. ​During the second half we worked on 4 main projects and used the content we generated above. We revamped the Small Batch website which resulted in a boost in online sales. We received an order for Mitten Bites from Lulu Lemon as a result of the upgrade. Furthermore, we developed a sub domain for the DFA website about the partners and the alumni in order to create a narrative. We wanted to tell the DFA story and to do that, it was important to put the voices of partners as well as alumni out there. Each item in the website opens to give the viewer a short overview of how the alum/partner is connected to DFA and includes a short video of the interview. We were asked to analyze the current production process and suggest ways and means to optimize it in order to increase production. After exploring the nitty gritties of the production process we made our recommendations. We created a different shift schedule which optimized the time spent in the kitchen so that the workers would not be idle. Our method should ideally increase production by almost a 1000 mitten bites bars per 6 hr shift. We set up the infrastructure so that posts could be planned, scheduled and sent out and someone wouldn’t have to constantly manage the accounts. We sent out at least 15 posts and expanded the reach of the program. Some of the posts received more that 2000 views. After participating in one of the tours hosted by DXF, we realized that the mission of Mitten Bites would fit in perfectly with the work of DXF. There was also a need for a snack during the bar tours that DXF conducted. Mitten Bites are now an optional snack in the private tours that DXF offers and DFA will be a feature on their small businesses tour. Mitten Bites would have fit perfectly at Duke. They are a product made by the students of DFA and they are a good fit for the health conscious student body. We reached out to Duke Dining as well as DukeEngage. The Mitten Bites will be a feature in the Duke Engage Academy 2017-2018. They may also be a feature of Red Mango at Duke. We created marketing material for the same. We worked on a few small projects as well. We conducted a workshop for the students on how to use LinkedIn and Seelio. Tommaso produced a video for the Kite Festival and it was used in their marketing campaign. We participated in an event that DFA hosted at the Detroit Boxing Gym. Our work with DFA taught us a lot. It highlighted our specific skill set while giving us the opportunity to new things and learn on the job. We are grateful for this opportunity. TechTown is a Detroit-based non-profit start-up incubator aimed at sparking economic revitalization throughout the city through social entrepreneurship. Divided into three sectors, Labs, Blocks, and Spaces, TechTown looks for equitable growth in tech, retail, and various other ventures throughout Detroit. We worked with the Labs department on a project aimed at increasing the demographic diversity of clients in the technology sector. We helped TechTown redesign their data collection process, improving their chances of receiving grant-funding, and created an action plan based on qualitative research for the recruitment of more minority-owned and woman-owned start-ups. Our goal was to help TechTown reach an ideal representation model that would reflect the ethnic and socioeconomic diversity of the city of Detroit. Our purpose was to analyze and compare the data collection process and offer recommendations via the advice and feedback of past clients, DTX-fellows, and other incubators. Our Data Collection Plan, including visual process maps. Other reports can be accessed at the links above. The above files include our animation video for Care PRN and a PDF of our final report, with more in-depth information. Street Democracy was started to bring legal services to the homeless wherever they are. Legal issues are not the only bars jailing our clients. Unless we address the underlying causes of their poverty, we are merely performing legal triage. We advocate for systemic reforms such as rehabilitative sentencing. In lieu of the homeless paying hundreds of dollars in fines, making their living situation worse, they sign up for counseling, enroll in job training, and regularly volunteer in their community. This alternative will allow clients to better themselves and be a positive impact to the people around them. Within 6 months of graduation from the program, 97 percent of graduates had stable housing, 91 percent had stable income, 90 percent had no contact with the criminal justice system, and 100 percent had no new misdemeanor or felony charges. Create a video campaign of past clients in order to help resume the Street Outreach Court Detroit (SOCD). Create the company's inaugural Policy and Pie event where the public can comment on current policy and legislation. Making 250 calls to previous clients. ​Conducting face-to-face and phone interviews. Creating 30 sec - 1 min promotional videos. ​Creating a 5-10 minute promotional video. Planning and executing our Policy and Pie event. Creating ​an exit memo for future employees. We got in contact with the graduates of the Street Court program so that we could interview them on their experiences in the program, their status after exiting the program, and any feedback on how to improve the program in the future. Questions were divided into three sections in where they would describe many aspects of their life during and after the program, as well as what they thought of the program in general. In the process we heard and were able to share some amazing and life transformative stories. Attendees heard about Street Democracy’s current projects and policy proposals, as well as local and federal policies under consideration regarding homelessness and poverty. In addition, people shared their thoughts on issues they wanted us to address in the future. And yes, we really did have pie. We got to expand our skills to planning and executing an event. We sent out press releases, worked on various forms of social media, and learned how to do graphic design for flyers and posts. "Street democracy is the GPS for anyone who needs a little direction in their life"
Build Institute is an entrepreneurship hub and small business incubator located in Corktown, Detroit, and asked DukeEngage interns to evaluate its impact in the greater Detroit area and recommend next steps. Our original project proposal was designing and coordinating the 2017 Annual Alumni Survey, and producing an Impact Report with the information gathered and analysis company reports. Build also wanted us to work with the Detroit-based metric collection, mapping and analysis organization Collective Metrics in their initial efforts in testing their product in "the field", which was our Alumni Survey. As we worked on these main two projects, however, we also noticed how we could contribute to other areas and needs of the organization, in order to help Build as much as we could. With the goal of giving an overview of the Detroit entrepreneurial ecosystem and contextualize Build Institute’s role within this business climate, along with providing some recommendations for next steps for the organization, we worked on hollistically evaluating Build Institute's impact in Detroit. • Provided recommendations based on alumni feedback from the survey. In order to collect the information needed for the Impact Report, we elaborated the 2017 version of the Annual Alumni Survey and coordinated all aspects of its testing and delivery. • Coordinated marketing efforts through emails, social media posts, and private communications. As we realized the need among Build graduates for more marketing resources and assistance, from the alumni surveys, we worked on providing Build with an action plan to address the issue. • Propose a basic Marketing Master Class curriculum and means of delivery. • Determine revenue, variable and fixed costs, profit and profit margins (cost analysis). • Elaborated a density map with key areas where Build could focus its efforts. • Coordinated Build's stand at the Concert of Colors. Detroit Future City is a non profit organization which aims to implement the Strategic Framework, a detailed plan devised by stakeholders of the city for the city’s future. It includes topics areas such as economic growth, land use, city systems, neighborhoods, land and building assets. During our seven weeks at DFC, we had the opportunity to work and contribute to several areas of the organization including the 139 square miles report, fund development, the Field Guide, and social media analytics. Miles, an 80-page statistical report of Detroit, to explore the city’s progress and ongoing challenges. Developed and presented key strategies regarding online donation platform, donor pitch, and donor acquisition, which were adopted by Executive Director and PR team to launch DFC’s new online donation portal. Compared all peer nonprofit donation platforms and recommended PayPal to DFC. Suggested addition of historical background of blight and vacancy to the donor pitch. Recommended creating LinkedIn page as a new donation channel. Compiled information of 20+ potential funders to strategize a new fund development plan. Conducted research about 20+ potential funders including foundations, corporate and government funders. Compiled information such as funding focus areas, giving cycle and average donation size. Collected data on the neighborhood using GIS maps and created presentation to apply for a grant for a child-centered community planning project. Used Policy Map and Loveland maps to find income, health, and other statistics for two census tracts in the neighborhood. Gathered information about the Thurgood Marshall school, such as demographics and school programs. Conducted research on the costs of maintaining community gardens and wrote 15 page report of findings and recommendations to initiate new Maintenance Fund. Called eight past-year Mini Grant grantees and interviewed them about their maintenance process and relevant costs. Conducted research on costs of different maintenance items, including water system, garden tools, and landscaping supplies. Identified potential resources and platforms that can enhance Maintenance Fund. Analyzed social media performance, gave recommendations for social media report metrics and content in order to improve DFC’s social media presence. Broke down social media activity into four categories: Output, Reach, Engagement, and Conversion to the goal. Recommended new metrics for social media, E-communications, and media report. Recommended methods to improve media content. Our main project at MoGo was an evaluation plan to be used as a framework for an annual report at the end of 2017. Putting together this plan entailed identifying the key areas for which it would be important to assess MoGo, such as user demographics, community outreach or integration into the existing public transit landscape. In choosing them, we kept in mind the emphasis of MoGo on being a pioneer of accessibility and inclusivity (through the $5 annual Access Pass, the cash payment option or even the future Adaptive bikes pilot program). Once we had selected these focus areas, we came up with evaluation questions and specific qualitative and quantitative metrics, which could be used to answer them. As we delved into each section more deeply, we realized that there were many more elements that would fit into our larger plan. Since MoGo launched May 23rd, we planned out the majority of data gathering for a later date, but we rapidly identified work that we could already begin. We began constructing a variety of surveys. Not only an annual survey to gather thorough data about MoGo users, but also a survey to send out to local businesses, a survey to evaluate the experience of MoGo ambassadors (program of MoGo advocates in the 10 neighborhoods of the service area) and even two intercept surveys to gather real time data from people walking past MoGo stations and people checking in/out bikes. This led us to elaborate a framework for recruiting volunteers to continue intercept surveying once we left. We also realized that for the Integration into Public Transit section, the data analysis of proximity of MoGo stations to other public transit stops (bus, Qline, People Mover…) could be done during our time here. In addition, we also thought about how the data gathered could then be visualized. We did some research into how to use Tableau (a data visualization software) and showed what we learned to Rory Lincoln (MoGo Program and Access Manager). As projected, the evaluation plan did not take up all of our time at MoGo and we assisted Rory with a variety of community outreach projects and events. Helped Rory advertise an Ambassador-led outreach event in Clark Park (in South West), through door-to-door flyering and giving out information cards. We also got involved in a variety of different projects, including a MoGo/DXF tour, a MUFI info session, and developing a series of featured rides to post on their website. Detroit Experience Factory(DXF) is a grassroots non-profit that uses interactive experiences and innovative resources to help newcomers and locals alike get more connected to the people, places, and projects in Detroit. We were tasked to develop an Economic Impact Report using information and data we researched or collected ourselves. Along with the Impact Report, we worked on many mini projects and developed our own side projects that would benefit the operations of the organization. Detroit Experience Factory has been committed to giving context to the narratives in Detroit and its community for over 10 years. Conducting an economic impact report adds a new dimension to DXF’s mission of storytelling by showing the quantitative and monetary impact on Detroit’s economy that comes along with the tours and the Welcome Center. This new perspective helps substantiate the benefits provided to the community and business partners, which could attract an untapped audience to join or support DXF. Researched the optimal spending multiplier using Bureau of Economic Analysis’s Regional Input-Output Modelling system to identify the overall magnitude of indirect spending. Used metrics from Cobo Expansion Report and 1998 Michigan Welcome Center Survey to determine the economic impact of the Welcome Center. Surveyed people who took a public tour in the timeframe of the previous 1 to 3 months (March 2017- May 2017). Determined seasonal effect on the amount, kinds, and frequency of visitors to the Welcome Center. Analyzed the different spending patterns of the different categories of visitors to the Welcome Center and tours. Enhanced visibility and engagement with locations introduced on the tour by designing end cards specific to the tour. Developed new interactions between small businesses and DXF either to incorporate as stops in tours or to partner with for future events. Organized city locational data into easy to read categories for a city app. Original Project Proposal: Detroit Food Academy asked DukeEngage students to help them promote their for-profit session, Small Batch including marketing, inventory system building and office organizations. Small Batch also owns the student-driven granola bar Mitten Bites. DFA also wanted DukeEngage students to help promote the newly launched bar in Detroit area by marketing on social media, increasing exposure in farmers' market. We worked a lot on promoting the brand of Mitten Bites. We managed two accounts of DFA ( Facebook and Instagram) and went to kitchen and markets to take pictures as marketing materials. We also conducted interview videos to promote leadership in DFA. •Eastern Market, Whole Food, Wayne State Market, etc. To help our student employees better build up their life, we started to format a summer curriculum to make sure they can get more help in each week's meeting. We worked with Shamil Khedgikar, a graduate intern from Cornell University, to draft eight boards outlining various statistics, assets, and development goals for six key areas in Corktown. The information on these boards will be included in the final Place Plan that will be created and submitted.Brainstormed various zoning and delineation strategies for the Corktown area. Researched relevant statistics to include in the reports, such as general demographic information, education levels, income levels, etc. 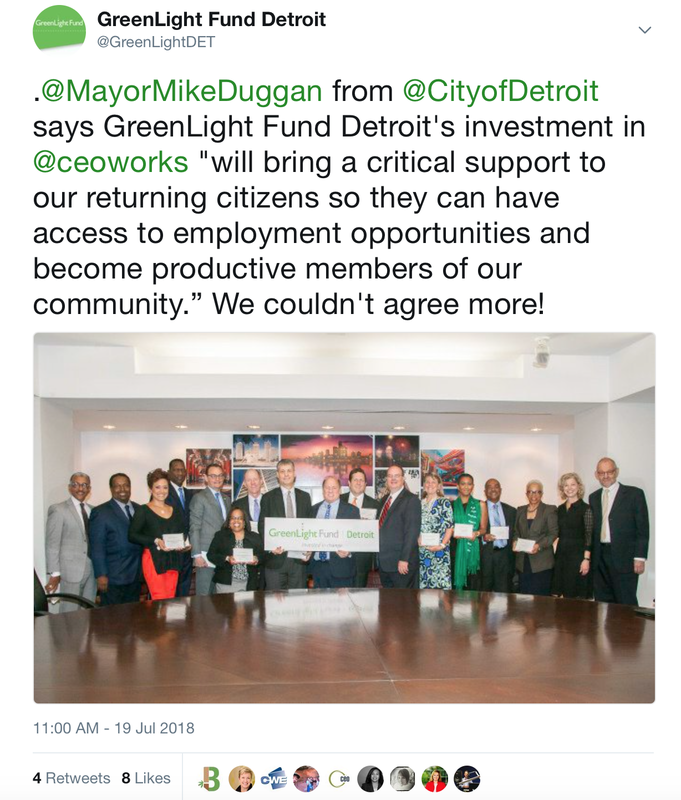 We worked on social platforms to further connect CEDC to the Corktown community. This project was developed to create a temporary parklet for Corktown residents/visitors to relax in. However, halfway through, this project was discontinued due to similar projects being proposed (and selected) for participation in the People First project. •Drafted a project proposal outlining possible business sponsors, locations/dates/times, parklet features and programming events. Our project for the summer was to conduct an economic impact report for Build Institute to examine its effects on the Detroit community over the last 5 years. •Compared Build’s efficiency in serving entrepreneurs to similar training programs, such as TechTown, ProsperUS, and Ann Arbor Spark. We were tasked with understanding DTX's economic impact since its inception in 2013. Through data collection and written/graphical analysis we came up with many quantitative metrics to evaluate economic impact, including launch rate, jobs created/retained, and revenues generated. We also sought to understand qualitative measures of DTX's success and gathered 9 interviews/testimonials showcasing various ways the program has impacted them. We also sought to improve the program's marketing strategy; we conducted a case study and developed several high-level strategies and tactics. We created a directory of 120+ women's, minority, and entrepreneurship organizations at 24 Michigan universities and a timeline of career events. •We performed market research and competitive analysis for CityInsight's first product, CityWater, an app that allows users to track their real-time water usage, detect leaks, and pay their bills in-app. We researched and segmented the market and came up with key market statistics such as total annual household costs and annual growth in water costs. We also researched CityWater's major competitors to determine areas of improvement and areas of competitive advantage (future product features). We created official slides in their pitch deck and helped complete several grant applications. •We gathered quantitative metrics of TechTown's impact since 2013, broke down its investments into private and public funding, and compared it to other incubators/accelerators in the region. We created live-updating graphs that monitored NextEnergy's progress on meeting its fiscal goal of spurring $25 million of investment in Michigan. •We calculated savings and payback period for lighting upgrades done on NextEnergy's campus and then wrote and designed a project profile highlighting these savings. •We created another project profile of a company's lighting demonstration on NextEnergy's campus. •We did research into the theme of smart cities and presented our findings to NextEnergy. •We worked on gathering data to assess Midtown's most pressing transportation problems. We worked closely with the DTX Launch Detroit program, a 10-week summer accelerator for college students and recent graduates from the state of Michigan. Throughout the summer we worked on 5 main deliverables focused on improving marketing to recruit better talent and to better evaluate the program for the future. The main focus of the work we did this summer was to work with vacant lots in Detroit. This included helping to design a green calculator that would assess the value of a certain parcel of land and what the benefits would be. In order to do this to the best of our abilities, we had to do a vigorous amount of research on other comparable calculators to discover what features we like and what we didn't like. We then compiled this information to come up with a list of inputs that we wanted and what results we wanted to see. We then started to work on developing the equations that would be entered into the calculator to generate the results. We also did an extensive amount of work to the benefit of the field guide, which is a online resource and a book that has a selection of 35 different lot designs people can use to improve their open space in Detroit. The work for this included writing local examples which involved interviewing different businesses throughout the city and sometime the region to add some personality to the lot types. •Spreadsheet of all possible resources so people can do work on their property legally. Developing new methods, medias, and styles through which to tell the story of the DFA, and furthering the organization on its journey to become a more self-sustaining entity through the sale of its student design product ("Mitten Bites") at local grocers, cafés, and farmers' markets. Exploring how TechTown can accelerate business revitalization in Grandmont-Rosedale and Osborn neighborhoods through commercial real estate acquisition. •Quantitatively analyzed LocalData results, including analyses of business types, commercial properties conditions, etc. Created graphics to include in our supply-side analysis. Developing Business Model Canvas and Investor Presentation as well as helping design the supply chain for LithSafe, one of Tech Town's clients. LithSafe provides products and training to suppress fires caused by lithium ion batteries. LithSafe also designs storage units to safely transport and store lithium ion batteries, mostly for hybrid cars. They are currently concentrated on working with motor companies before later expanding to other products such as boats, planes, trains, iPhones, and other electronics. •Came up with ideas for improving prototype design; and generating ideas before first prototype before the container is shown to major car companies such as Ford, Tesla, and Volkswagen. •Offered employment to DFA graduates, provide financing for DFA programming, and spread awareness of DFA. •Made Market Inventory checklists, Market Sales Data Sheets, Order Forms, and Kitchen Inventory Sheets more simple and more effective. •Hive’s “BUILD” program, is an eight-week business and project planning class for both aspiring and established entrepreneurs. Attracting vendors and creating publicity and attendance for the Fenkel Street Market-- ensuring that it is not just a block party, but attracts entrepreneurs and supports the idea of creating start-up business in that area, which would then bring more foot traffic to the Brightmoor community.